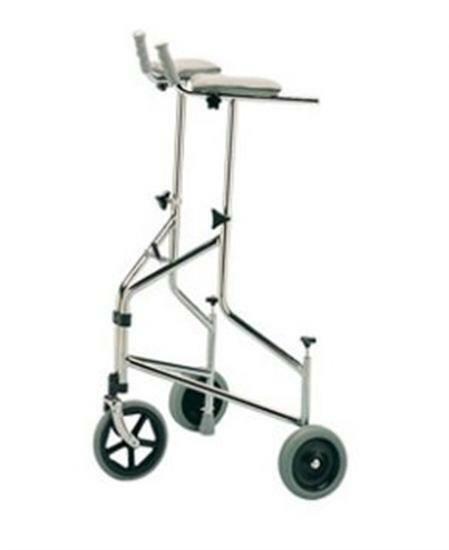 Folding Three Wheel Walker Easy Manoeuvrability. Say hello to this high quality tri-wheel walker. It may look like a basic walker but it has quite an array of smart features! To begin with, it has a chrome plated steel frame that makes it sleek, stylish, and very strong (without being heavy). It has a swivel front wheel that makes manoeuvrability effortless and easy, and all of its solid wheels provide stability and durability making this a three wheel walker built to last. There are easy to adjust attachments to support and relieve arthritis sufferers, and the push-down brakes are ideal for those users that have problems using their hands for support and control. The handles are height adjustable, and the whole walker can be folded away making it easy to transport or store.